My first camera and first published image sit on a studio shelf. Photo taken with an iPhone. 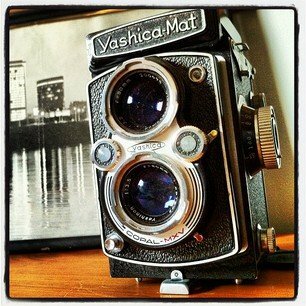 My father finally allowed me to play with his prized Yashica Mat Twin Lens Reflex camera when I got old enough and I was hooked. Soon after, I started taking pictures for my high school’s newspaper and yearbook and was a founding member of the camera club. My first real photographic job was as a summer intern at The Hartford Courant, and they subsequently hired me as a staffer while going to college at the same time. I’ve pursued photography passionately ever since with a career that has spanned from a photojournalist in exciting times of historical events and personalities, to traveling the world as a corporate photographer for a Fortune 500 company. I met Joanne at that company and we set a course to run our own show, which we have enjoyed doing ever since. The clients are always varied and the work never stagnant, and I love the diversity and challenges. I’m always evolving and totally enjoy the changes I’ve seen in my photographic career. Being a computer and gadget geek at heart, I’ve also designed and built my web sites and am also a FAA certified commercial Drone Pilot, just in case that shot or video needs a higher vantage point. Our studio is attached to a 220 year old historical house in the East Hartford / Glastonbury line and is listed on the National Register of Historical Places, which we share with our two lovely Wirehaired Pointing Griffons – Luca and Josie.